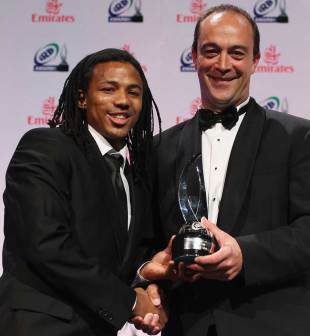 The South African Rugby Union has led the tributes to the newly crowned IRB Sevens Player of the Year Cecil Afrika. The Sevens star finished the season as the HSBC Sevens World Series' top try and points scorer crossing the line for 40 tries and contributing 385 across seven events. And the SARU President, Regan Hoskins, paid tribute to the Sevens star saying: "He has a never-say-die attitude that rubs off on his team mates and it was great to see how he inspired them to capture three tournament titles last season. "This prestigious accolade is well deserved and I want to wish Cecil and the Springbok Sevens all of the best for the upcoming HSBC Sevens World Series. And the 23-year old dedicated his award to his team mates: "I am extremely proud of the award but I view it as an accolade for the team. My team mates, the coach and management all worked very hard and we endure the joy and pain together. The Springbok Sevens team is one huge family and I want to thank them for their continuous support and encouragement." Springbok Sevens coach, Paul Treu, also had high praise for Afrika. "Cecil is an outstanding playmaker and his best attribute as a rugby player is probably his ability to maintain the same level of consistency throughout the season," said Treu. "The team struggled without him in Wellington when he was out due to a broken jaw, but he quickly bounced back to make a telling contribution in Las Vegas, where we won our first tournament of the season. He was also instrumental in our Cup wins in London and Edinburgh. "He works extremely hard during training and he really puts his body on the line for the team. Apart from his excellent kicking skills and attacking instincts, I also think that defence is one of his key strengths. He was not a first choice for the team three years ago. In fact, such was his desire to succeed that he trained with us for a full season without a contract, so that he could establish himself in the team. "What he has achieved since then is just incredible and his rise through the ranks from a very humble childhood in Port Elizabeth to a star performer on the world stage is just an incredible and inspiring story."